PRAGUE ““ On a cold December evening in 2009, 26-year-old Karel Goldmann faced an uphill battle and he knew it. He had just proposed to his fellow synagogue board members a low-key, meet-and-greet between the members of Bejt Simcha, one of Prague’s progressive synagogues, and Emir OmiÄ, the imam of Prague. Goldmann’s idea was to give members of his community a chance to learn about Islam from a Muslim leader. But when the matter came to a vote, there was only one voice on the seven-member board in favor of the proposal: Goldmann’s. Self-effacing and with an easy laugh, Goldmann does not seem the controversial type. Yet he has become one of the Jewish community of Prague’s most outspoken grassroots advocates of Jewish-Muslim dialogue at a time when such ideas are unpopular among many Czech Jews. In the Czech Republic, where the small Jewish community is apprehensive of Muslim-Jewish interaction, interfaith activities like those Goldmann supports are viewed with skepticism. It’s not too hard to find Jewish-Muslim dialogue in the United States, from national programs to events at individual synagogues. But in the Czech Republic, the little formal Jewish-Muslim interaction that exists is limited to top religious leaders. As with other communities in Europe, Jews in this community of 3,000 to 4,000 people are mostly wary of Muslims. Muslims have been linked to anti-Semitic incidents on the continent, and many Europeans view Muslims as threatening the European way of life. He blogs for Idnes, the Czech Republic’s second-largest newspaper, about how prejudice and xenophobia plague both Jews and Muslims. He contributes to a magazine called Secrets of Islam. He writes articles in his synagogue’s magazine about similarities between Judaism and Islam and the insidiousness of anti-Islamic rhetoric. Even in his progressive congregation, it’s often a tough balance between being an advocate for Muslim-Jewish ties and a synagogue leader. Goldmann’s outspokenness on Muslim-Jewish issues is the culmination of a pair of personal journeys that began when he learned of his Jewish roots at the age of 18. Judaism played almost no role in the Goldmann family’s identity. Goldmann’s grandfather, an assimilated Jew with German roots, abandoned his family and fled to Germany after the Communist coup in 1948. Those he left behind suppressed any connection to Judaism. As the Iron Curtain came down, Czechoslovak Jews won the freedom to practice their religion. But the history of assimilation and community repression had made its mark. Although Goldmann was occasionally teased about his Jewish-sounding name at school, at no point during his childhood did his family ever talk to him about his Jewish roots. He learned of them only in his late teens, when his father mentioned them in a conversation about religion, in which Goldmann had developed an interest. Goldmann soon embarked on a quest to discover what being Jewish meant. He turned to Orthodox Judaism, that of the official Jewish community here, but found it too restrictive. Although he eventually underwent an Orthodox conversion so that he could participate fully in religious services – Goldmann’s mother is not Jewish – Goldmann found his true home among progressive Jews. Then came his political awakening. 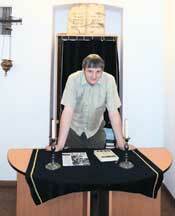 In the early 2000s, Goldmann enrolled as a student at Charles University in Prague, intending to study Judaism. But because there was no separate Jewish studies program, Goldmann was placed in classes with students studying other religions, including Islam. “Before I started university, I thought that Muslims were trying to convert us to Islam or were going to make a jihad on the Czech Republic,” Goldmann said. Getting to know Muslims personally helped him overcome deep-seated prejudices about them. After graduating, Goldmann began blogging for Idnes about Jewish-Muslim issues, and he soon came to the attention of LukÃ¡Å¡ Lhot’an, an editor of the magazine Secrets of Islam. The two became good friends, and Goldmann became a contributor to Secrets of Islam. Although other Jews don’t share his predilections, Goldmann believes that his friendship with Lhot’an and other Muslims helps the Jewish community. “When I talk with the Muslim community in the Czech Republic, it makes our image better,” he said. When it comes to Israel-related issues, Goldmann recognizes there are differences between the two communities, but he says part of that is public posturing. Over a beer at the pub, his Muslim friends aren’t as dogmatic as in public. The only way to change things, he says, is to push for greater friendships between Muslims and Jews. Meanwhile, Goldmann has become a leader in his synagogue, involved in fundraising and other inter-communal outreach programs. There have been times, especially during the past year, when he thought he might have to shelve his interfaith work so as not to do damage to Bejt Simcha, which is trying to grow. But ultimately, Goldmann says, he can no more hide his frustration at the growing anti-Muslim rhetoric in the Czech Republic than he can deny his Jewish identity. Now, more than ever, he must speak up, he says.